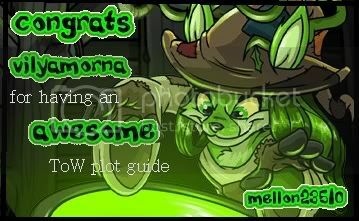 Welcome, guest, to Vilyamorna's Plot Guide! I'm Vily, your host for this (hopefully) helpful little guide. 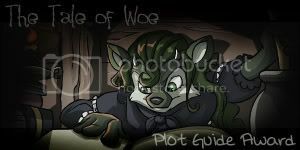 This will be a continually updated guide for the Return of Sloth, the current Neopets Plot. With any suggestions, questions, comments, or theories, please feel free to neomail me! I love getting feedback, and I'll try to get back to you as soon as possible. Also, don't hesitate to send me links to guide directories or non-flash comics! However, I am having a few problems with neomail lately. If my inbox is full, try again a bit later. Also, the requests I'm getting for one-on-one plot help are getting pretty numerous. Please only neomail me for this if you've tried carefully rereading the section a few times, going through alternate methods listed, and troubleshooting (clearing your cache, battledome, etc.)! If you find what I have here helpful, please link to me! What is the Return of Sloth? Chapter 8: Battle is Joined! 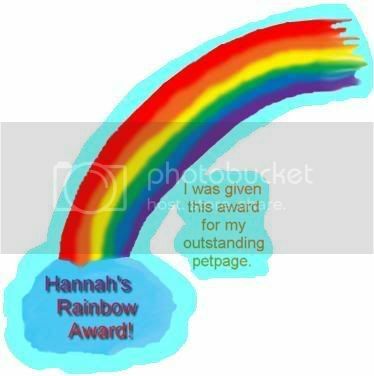 Credits | Awards | Link to me! The Return of Sloth, also known as the Space plot, takes place (wait for it)... in space. The Virtupets space station, to be precise! This plot was actually started once before but discarded-- ever wonder what the Discarded Magical Blue Grundo Plushie of Prosperity was for? It's a remnant from the last return of Sloth. I'm going to hazard a guess here and say that this plot will likely involve the attempted return of Dr. Frank Sloth and probably some Battledoming, if not an all-out war. Thus far, the main characters are an as-of-yet unnamed Cybunny, as well as Gorix and Cylara, who you might recognize from the game Moon Rock Rampage. a door. What should we do-- investigate it thoroughly before wantonly entering it to possibly face our own complete and utter doom? No way, silly! "Leap before you think" will be our motto for this plot (sorry, Issun, I'll give it back later)! You will find yourself in the Maintenance Tunnels! Anyway, while there are three doors and a corridor, thus far you can only click on the door in the left. I've outlined it in purple so you can see it. Hey, look! It's Gorix! Hi, Gorix! What's that he's got there? Jinkies, crew, he says it's a control panel, but to me it looks like a minigame! Before you start, let's take a look at the game itself, a series of tubes (you mean like the internets?). There are a few things you should know about. Start: The door that you just came in from; where you start. Goal: The door that you're trying to get into; where you finish. Gorix: Who you're controlling; the Neopet you're trying to get from start to finish. Pressure Door: All of these must be closed before you reach the goal. Whenever you or a maintenance robot walks through one, it will close behind you. Gravity Generator: A sort of turntable located at a crossing of paths; Gorix (or a maintenance robot) will go in whichever direction the arrow indicates when he walks over it. Click it once to rotate it 90 degrees clockwise. Also, once someone walks over a gravity generator, it will rotate clockwise once. Maintenance robot: A robotic minion, oh noes! They move in a straight line until they hit a wall, at which point they turn down the next open path. Basically, don't let them touch you, but don't hesitate to use them to help close pressure doors! airlock: Beyond the airlock lies, obviously, space. It's not a good idea to go out into Space without a space suit, in case you didn't know, and Gorix isn't wearing one (basically, avoid running into these as well). Go" button: Press this when you like the configuration you see on the screen. Turns into "Stop" when Gorix is in motion. This game wasn't too hard for me, but then again, I'm the kind of girl who enjoys writing snarky extensively-detailed walkthroughs. So I'll show you how I solved the puzzles. The purple arrows show the direction of the small blue arrows on the gravity generators. note: There are more than one way to solve most of these tunnels, and if you find a way that works better personally, then use it! DON'T LOOK AT THE FOLLOWING FOUR IMAGES OF THE TUNNELS IF YOU WANT TO SOLVE THE TUNNEL PUZZLES YOURSELF! Thanks, Gorix, I couldn't have said it better myself. Chapter two is a comic-only update (either follow the comic link, or go back to a series of tubes and click the "continue" arrow). Why, hello there, Garoo! Did you enjoy the latest thrashing I gave you in the Battledome? Er, I mean, my, how frightening.. If you haven't seen it yet, check out the newly-revamped Virtupets space station, snuck in sometime today between the hours of noon and three in the afternoon. First, there is the comic. Go read it to meet the resistance and get some backstory. I like how the Grundos are freed just to do manual labor in setting up the Resistance's swanky base. Well, we've got our next step.. but I bet by the end of it you'll be wishing we didn't. Head back to the maintenance tunnels, and click on the newly-opened door! We are apparently at the headquarters of the Resistance. Swanky. This time, instead of a maze, we get cryptography: there's a control computer, and without much ado at all, Cylara advocates hacking into it. And she seemed like such a nice young Cybunny... well, dust off your grey hats, people, we're going to be doing some brute force for the Greater GoodTM. Click the first message. If your first message doesn't have only one modifier, try other messages until you find one that does. everyone's messages are randomly ordered, so your message one will probably not be the same as mine. Anyway, how nice-- they give us the ability to crack their code in one little window! Basically, click and drag the chosen sequence into the hollow box to see the result. It's possible to just click random modifiers until you get the right one, but there's a better way to do this for the messages with two or three modifiers. NOTE: While the symbols always add up the same in each sequence, everyone's modifiers, key, and target are different, so it's very important to understand how to solve this on your own! You can see in the fourth column that C + V/L is V/L. The number 0 is the only one that can do that in addition. You can also see in the third column that X + X = V/L. Since 1 + 1 = 2, we'll make those symbols be those numbers. Which brings us to the third from the right: V/L + C = V/L. With C acting as 0, this also works. And finally, the leftmost column: X + V/L = C. Now, hold on, you might say. 2 + 1 does not equal 0! Oh, but yes it does... if you're counting in base-three instead of base-ten. Hooray! ...My sense of accomplishment is somewhat overshadowed by how completely useless this message is. No matter, let's keep at it! As you decode the messages, their titles will also be decoded in the inbox. As a hint, try the less complex messages first: i.e., the ones that only need one modifier, then the ones that need two, then the ones that need three. For the rest, keep using the logical methods I described above to get the proper results. If you have problems treating it as four-digit addition, try separating each column into a separate addition, or thinking of it as symbols: for instance in a two-modifier puzzle, X+X+V=B. By focusing on the last column, you can easily narrow down your options. In even the three-modifier puzzles, if you work out just the first half of the possibilities (i.e., four symbol columns), you can narrow it down to just two three-symbol possibilities. If you want to tell logic to go climb a tree and because you don't mind a lot of mindless tedium, you can always do process of elimination. If you've played Time Tunnel or did the door puzzle in the Lost Isle plot, you're familiar with the strategy. The good news is that here, there's no limit to the number of tries; the bad news is that the indicator is a bit harder to read. Anyway, if you've never done either of those, here's what I mean. In an example with two modifiers, take option 1 and put it in the first box. Then, take option 2 and put it in the second box. If that doesn't work, take option 3 and put it in the second box... and so on, until you've exhausted all the combinations starting with 1. Then do all the combinations starting with 2 in the first box... and so on. Since there are thirty options for the three-modifier messages, this makes for about thirty thousand possible combinations, I think you can see how this would be much more time-consuming than taking the time to do some maths, even if you're not too good at math puzzles. There are always people on the plot board who would be more than happy to explain this a bit clearer; possibly even me. ;D.
VERY IMPORTANT NOTE: Even if you get the proper combination for "INCOMPLETE DATA", it will not work!! Work on the other messages before you tackle any incomplete ones; as you decode more of the three-modifier messages, the "incomplete data" messages will become complete and workable. The best advice I can still give, especially on the 3-modifiers, is to focus on one digit. For example, say the last digit is the one that looks like an 8: systematically try every combination that adds up to 8. For a complete list of all the three-modifier combinations WITHOUT O, visit the wonderful compilation by pikachuoooo. And so on. Just keep subtracting six to get to the symbol you need. And so on. Just keep subtracting seven to get to the symbol you need. For those of you wondering how to use the number tables above, here's an example of the process you'd use. It helps if you have a pencil and paper. Let's say you're doing a three-mod, and it doesn't have the "O" symbol in it. The first symbol of your key is C, and the first symbol of your target is B. Going by the charts, the first key symbol is equal to 1, and the first target symbol is equal to 6. Subtracting the key from the target (6-1) gives you 5. Your first goal, then, is to find three modifiers whose first symbols add up to five. For instance, this could be two that begin with V and one C (2+2+1). Or it could be two C and a X (1+1+3), or some other combinations. Now, even matching up the first symbol leaves quite a few combinations, especially with thirty modifiers. The trick is to keep doing this to find modifiers that fit the first four symbols, one at a time. For instance, list all the combinations of three that fit the first column; then, of those combinations, cross off the combinations that don't fit the second column; of those, cross off the combinations that don't fit the third column, and so on, until you're left with one or two groups of three (or a more manageable number to tackle with trial-and-error). To help explain "number wrapping" and how to decide which number is indicated by the symbol, here's an example. This one is taken from someone's real key and target. The key is TTBBTVZB and the target is CBVVBVVX. When you change those to numbers, the key would be 5 5 6 6 5 2 4 6, and your target would be 13 12 14 14 12 8 8 9. In this case, I wrapped the majority of the numbers once or twice. Basically, try the lowest possible number that is still larger than your key-- in this example, for C, that would be seven. But remember, the lowest modifier combination value is three, so seven wouldn't work. Add another six, and you get thirteen. If your target's a larger number, it's easier to solve. So, when you subtract the key from the target, you end up aiming for modifiers that would add up to 8 7 8 8 7 6 4 3. Start with one column and work your way through! Anyway, if you keep following these methods, pretty soon you'll be done with all your messages! I've added pictures of all mine for reference. Once you've decoded all 20 messages-- or at least enough to get a message from Garoo-- then go back to the tunnels, to see the fruit of your hours of eye-crossing decoding. Another comic update! Wow, I'd totally enjoy this more if my eyes weren't destroyed by starting at limegreen-on-black for ten hours. In case you had any doubts, you can tell Dr. Sloth (for the duration of this guide I will call him Frankie, and I encourage you to do the same; he's really quite cuddly) is evil, because his speech bubbles have a black background. In case the entire "enslave Neopia" thing didn't tip you off, y'know. ...Moving on again. This time, let's move on to the maintenance tunnels. Well, what do you know-- the last door is open! It's so inviting, it's just begging to be clicked. So click it! Garoo Elite 1: Hey, did you hear that? Garoo Elite 2: Huh? It's probably just the wind. Garoo Elite 1: Oh, so it wasn't a two-Neopet team of utter destruction sneaking up behind us, then. Anyway, there are a few things you should know about before you start. Cylara: The character you're controlling. Start: the door that you just entered. Not marked on my maps, because Cylara is always right in front of it. Goal: the door that you're trying to make it to. On my maps, it is marked with a green X. Red space: You can move here eventually, but not in your next turn. Green space: You can move here in your next turn. Civilians: Don't do much except stand there. Feel free to use them as cover while you ambush the Garoo Elite. They come in quite a few species: Kourgas, Shoyrus, etc. On my maps, they are marked with blue dots. Garoo elite: Their movement is pretty random. Don't stand in front of them, or else you will get caught and the level will restart! However, if you are within one space of them, you can click them and knock them out and move onto the space they were occupying. You might be able to avoid them and make it to the end of the level... but if you need some stress relief after the codebreaking, then take it out on them! The blaster noise when they fall is quite therapeutic. On my maps, they are marked with red dots. Cylara's parents and Cybunny scout: don't tell me that you could tell what they were from such a tiny picture. Anyway, they just sit there and act like they really want to be rescued. On my maps, they are marked with a green x (because they're the goal for the fifth level). Click any green space to move. You can only move one space up, down, left, or right, and onto the large dark teal tiles. Now, when you move, the Garoo Elite will move as well. They have the same restrictions as you do, but they can also stay in place for a turn. If you are within one space of the Garoo Elite, you can click his space, knock him out, and proceed. If you get in the line of sight of a Garoo Elite, an alarm will sound and you must start the level over! shuttle BAY 1: Move left until you're one space away from the corner. Stay there (move one space right, then one space left to waste turns) until the Garoo Elite is in the bottom left corner. Then, click him to knock him out! Continue to make your way to the door at the top. shuttle BAY 2: Many thanks go to the magnificent hampy3 got this screenshot for me because I accidentally forgot to get one when I was doing it. ^_^ Anyway, for strategy, try to knock out the guard on the right first. While stalking the guards, it's important to get as close as possible without being in THEIR range in one move. For example, never move to right behind them or right next to them; in their next turn, they could turn and catch you! shuttle BAY 4: Start with the Garoo Elite closest to you. You might have to do a bit of back-and-forth until it gets close enough to you. Work your way up, right, down, right, and back up, using the meat shields liberally and beating the Garoo Elite whenever the opportunity arises. I almost pity them.. Oh wait, they're the reason we had to decode those messages. Never mind, the pity's gone. Be merciless. shuttle BAY 5: If you look in the corner, you'll see what, at first glance, I seriously thought was some new monster. But it's not. It's just Cylara's parents and the Scout! That's a relief. They should try to look less like some three-headed mutant. Anyway. there are nine Garoo Elite here! You'll have your hands full trying to avoid them all, so eliminate them as soon as possible. Watch out for one Garoo Elite following another; this can be a tricky situation, especially if you're in a long straight path. I worked my way left, then up, then around. It was easiest for me to do this, but if you find an alternate route that works better in your opinion, then by all means go for it! Once you have a sizeable pile of Garoo Elites behind you (my personal body count was 21), you'll reunite Cylara with her parents! Woo hoo! Methinks the next comic will include a big chase, and probably a frustrated Ylana. Chapter five is a comic-only update. So go read it, and be witness on the front page to the laziest blaster sound effect ever. I mean, seriously. What's wrong with a good old "zzzap!"? Also, a note: whenever things look like they're working out according to plan after assaulting Garoo Elite, try and remember the other villains involved. And it turns out I was right about a frustrated Ylana.. if by "frustrated", I mean "shot in the face", in which case I was totally right. Chapter six is a comic-only update. Intrigued? Well, you're going to have to wait to see what's on that disc, because it's a really, really short update.. two pages? Let's start off with another two-page comic. That's really it for this chapter. But recognize that fruit? I bet you're even more intrigued. Ooh, four pages this time, titled "treason", which isn't a pleasant word. Or just don't bother with the silly split Grundo and just head straight to the Battledome to wipe the floor with some evil! There are three opponents: Garoo Elite Junior Squadron with difficulty 8, Garoo Elite Strike Commanders with difficulty 35, and Garoo Elite Specialist Riilan at difficulty 175. Well, kiddies, what are you waiting for? Set phasers to "PWN" and have some fun! important: battledome portions of the plot are not mandatory! You also need not have completed the rest of the plot to fight these challengers! Look, it's another comic-- complete with the Star Wars quote that any self-respecting space plot merits. Oh, Frankie, you're so silly: that many ships can't stop us! Anyway, don't worry: you can still fight the garoo elite in the battledome for now, at least. It's equally possible that the battledome remain open or closed for the next step possibly involving the Space Faerie's token-- either way, keep fighting as much as possible. No one is certain whether there are win limits (a certain number of fights that count toward your points; any wins past that number don't count for plot points), so just fight as much as you can for as long as you can. What an uninspired title for a comic-- the name of an FPS videogame. Woo. Anyway, read that up, or head on over to the Battledome to fight two additional challengers. note: at the time of writing, it is possible to fight both the Garoo Elite AND the new challengers. Anyway, this time we've got two opponents: Mutant Grundo Scouts(starting difficulty 10) and Virtupets Militia (difficulty 66). Neither are nearly as difficult as Riilan, so go smack them along upside the head with righteousness-- or continue beating up the Garoo Elites! Chapter eleven starts, of course, with a comic. Read on. Woo, nothing like some backstory! ...And a new battledome challenger, the Primary Grundo Bot RZ894! Its difficulty starts at 300. So go fight some more. So by now you've probably noticed that the updates have been slightly late. I am going through some very difficult family and personal problems in my real life at the moment that are limiting my ability to complete this step of the walkthrough. I'm sorry, and I know it's terrible of me to delay now after starting on it.. but if by the time everything's sorted out the step's still going, I'll update. Until then, try another walkthrough at one of the plot directories listed at the top. Once again, I'm sorry, guys. Hopefully I'll see you soon. 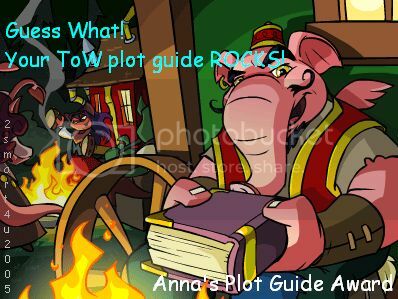 There are a few things that are important in general for a plot, and things that I've been seeing as huge problems pretty often when I visit the plot boards! For now, two of these issues that people have are with using the Battle dome, and things either disappearing sometimes or just not showing up at all. If you need a bit more detailed help with either of those, don't worry! That's what this part of the guide is here for. If you think of another issue that should be here, don't hesitate to neomail me with your suggestion! Sometimes the page just won't load properly-- it skips over an image, like the main door or the maze. This can be fixed if you refresh, either using the button at the top of your browser, or pressing the "F5" key at the top of your keyboard. If it still won't work, go on to step two. Whenever you visit a website, your browser will save information from the website on your computer, so the website will load more quickly the next time you visit. Sometimes, though, an older version of the page will get "stuck". When this happens, it's very easy to fix. It depends on what browser you're using. If you are using firefox, in the menu, click "Tools". In the menu that comes down, click "Preferences" or "Options", depending on which version you have. Click the "Privacy" tab, second from the left. In the set of tabs in the middle, click on "Cache", the farthest to the right. Click the button that says "Clear Cache Now". If you are using internet explorer, in the menu, click "Tools". Then, click "Internet Options". A box should pop up- if it's not already selected, click the "General" tab, the first on the left. In the middle section, there is a button that says "Delete files". Click this button. Now that you have cleared your cache, revisit the page. Everything should show up as it should! This plot, while not a "war", does have some Battledoming in it. A few people are having the same problems with this part of the plot, and so I've added this portion for some quick help. what happened to the earlier challengers? Most plot-related challengers are only released for a short time-- the way that the last "war" portion of the Tale of Woe plot was run was that TNT only released certain opponents to us at certain times. If this plot is similar, it appears that only three will be available at a time, all of a certain group. Once a new group is released, you can no longer fight any previous groups. For example, at first, threee Garoo Elite were released. My pet's not showing up in the dropdown menu to fight! 1. Your pet's HP is not 0. 2. Your pet is not hungry. If your pet's health is to blame, visit the Healing Springs in Faerieland every half hour, or use a healing potion on your pet; if it's hungry, feed your pet with an Omelette or Jelly (feeding will also bump up HP by a few points). 1. Visit the Battledome Status page. Your pet might just be stuck in a fight. It should now be released from that fight. 2. If that doesn't work, visit the Battledome Equip page. Unequip and then re-equip an item to your pet. It should now be available to fight. 3. If both of those don't work, try feeding your pet. That should remove it from the non-existent fight, and you should be able to battle again. If none of that works, try refreshing, or waiting until not as many people are on the site. What are your pet's stats? It could be that they're too low. If that's the case, try training in the Mystery Island Training School if your pet is above level 20, or in the Krawk Island Training Academy if it's under level 20. IMPORTANT: Dubloons and Codestones, the items you use to pay for the classes, are always more expensive during a war! Unless you have a stash, be careful, as you might have to pay as much as 4,000 more NP than normal. What attacks are you using? If you have effective offensive species abilities (like Kougra Swat), use them instead of the regular attacks! Otherwise, use Fierce Attack. Do you have any Faerie Abilities? Two very useful ones are Burrow and Heal. Try buying a few Bottled Faeries for the pet that you battle with. IMPORTANT: Bottled Faeries' prices will probably go up as well! Unless you find a good deal or really, really want these abilities, try making do without them. Also, try seeing what you have equipped to your pet. Since I'm a cheap battler, I personally use a Snowglobe Staff, a Pale Elixir, two Scarab Rings, a Leaf Shield, and Downsize. If you don't like that combination, check out the Battledome Neoboard-- the people there are always willing to help and recommend items. Thanks to the following people who have helped me out in some way or another, or just deserve to be mentioned! You guys rock! bhamv8, hampy3, pikachuoooo, spacefaerie34000, anyone and everyone who links to me, and anyone else who I may have accidentally overlooked. Guide (CSS and walkthrough) created by Vilyamorna. If you see anyone else using these images or this code, please let me know! 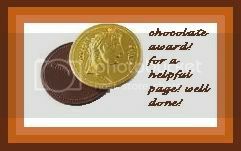 If you found my guide helpful, then please link to me (and only me-- don't point one of these to another guide, please) using one of the following buttons on your shop, lookup, or petpage!